In the first race, Guinness was very slow coming out of the box (the doors open differently than the ones at the parimutuel tracks, and of course there is no bell like at the big tracks) and the other 2 dogs in that race were 5 strides ahead of him when he finally came out and took off. But by the end of the race he had passed the field and won by 3 lengths. We were thrilled, but since he was a first-time runner, he had run in the slowest heat. So the next race they reshuffled the dogs and he ran against the faster dogs. This time he broke a little behind the others but only a length or so, and he won by only one length -- but he still won. Then for the third race they brought out the champion and the winners of the other two fast races and it was a 4 dog race: all the winners and champions and Guinness. This time he had it all figured out and all 4 dogs broke evenly. He passed the field about a quarter of the way down the field and won by 3 lengths! 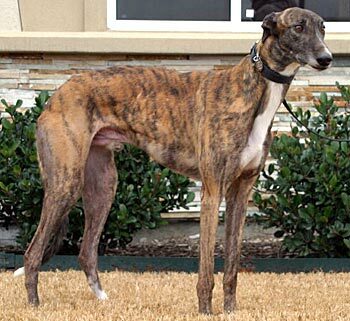 So his first time out, he was the fastest greyhound there, with a perfect record to boot. And he had a BALL!!! We had to physically pick him up and shove him back into our truck to get him home. He just wanted to keep turning around and looking for that bunny. The dog closest in points to him for the day (and actually ahead of him until the last race) was another brindle GALT dog, Mingo. She is really fast, but ran out of steam by the last race. Those GALT dogs are winners! Actually, there were bench-bred dogs, retired racers and amateur racing bred dogs all there representing the greyhounds, so it was neat to see that they all enjoy it. Guinness’ prior foster mom, and her daughter came out to watch the second race so he even had his own cheering squad. Gail was at the finish line and I was clear down at the starting box 200 yards away and I could hear her yelling when he neared the finish. Based on his very unusual First Time Entrant performance, Guinness has been invited to compete in the LGRA Nationals in Oklahoma on November 1 and 2. Can you believe it? He loves it as much as he loves lure coursing, and he is absolutely insane about that. We haven't entered him in formal lure coursing competition yet because they suspend the race meets for the summer due to the heat. 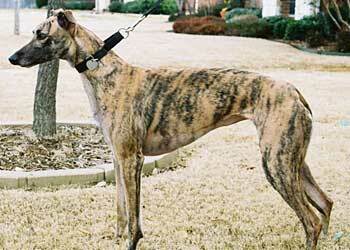 We can't wait to get him up against the really good coursers, including other greyhounds. Oh, and he starts Agility classes on October 8. We took him to the pre-qualifying event and he passed, so now he begins the actual classes. He is taking 8 classes. If he is enjoying it, we will continue. If he doesn't like it, we will go try obedience or stick to LGRA or lure coursing or try oval track (NOTRA) racing -- whatever he has fun doing. He is an amazing boy and we are SO thrilled with him. Thank you so much for getting us together. If anyone is interested in coming to watch or running their dogs in LGRA and NOTRA or Lure Coursing, the club GIT (Gazehounds in Texas at www.gazehoundsintexas.org) is the organization that puts on the most races in this area. There are breed-specific clubs that sponsor races as well, but GIT usually has them listed on its calendar, too. The race people who have their names and email addresses listed are fabulous about answering questions and steering you in the right direction. EVERYONE was fabulously helpful and friendly to us at the race as well as via email beforehand. They told us how to hold him, put him in the box, what leashes and collars to bring, loaned us silks for each race... you name it. Wonderful people. For more information on NOTRA and LGRA or other activities for you and your Greyhound, visit our Activities for Athletes page.